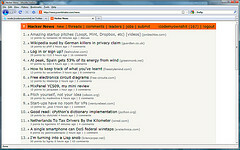 Like many in the tech and startup scene I enjoy reading Hacker News. It’s constantly filled with interesting and inspiring stories. It also happens to be a huge time sink. I can easily spend an hour reading stories about the latest unusual funding success, how to hack DRM, or a popular book review. So often I either avoid it all together to avoid wasting time or I don’t have the time to even read a single story. Kale Davis had the same problem and came up with a solution to help everyone in the form of a weekly email newsletter. Already in it’s 25th issue, Hacker Newsletter covers some of the most popular articles of the week, Ask HN highlights, along with classic posts and interesting topics. If you’re strapped with time or need to avoid disappearing down the black hole of crazy comments, Hacker Newsletter can help. I wouls be trying this out soon!Thanks for the share.